Description: This shrub is 5-20' tall, typically forming multiple trunks and a densely branched crown that is often more broad than tall. Individual trunks are up to 4" across, gray to grayish brown, and relatively smooth; they lack conspicuous lenticels. Smaller branches and twigs are gray to light brown, smooth, and terete; young twigs are often pubescent, but they become glabrous with age. Young shoots are light green, terete, and pubescent. Alternate leaves occur along the young twigs and shoots. 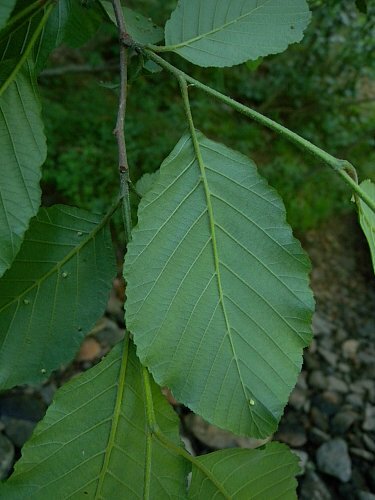 These leaves are 2-5" long and 1¼-3½" across; they are obovate or broadly elliptic in shape, while their margins are finely serrated and often slightly wavy. The upper leaf surface is medium to dark green and glabrous, while the lower leaf surface is medium green and glabrous to sparsely pubescent. When pubescence occurs on the lower leaf surface, it is usually concentrated along the central vein. Leaf venation is pinnate with 8 or more pairs of lateral veins that are relatively straight. The petioles are ¼-1" long, light green, and pubescent. This shrub is monoecious, producing male (staminate) and female (pistillate) flowers on separate catkins. Immature catkins are present during the fall and persist through the winter in a dormant state. During the blooming period, drooping male catkins occur in clusters of 2-5 near the tips of the branches. The male catkins are 2-4" long, narrowly cylindrical in shape, and brownish yellow. Each flower male consists of a lobed calyx and stamens (about 4), but lacks petals. Several male flowers are grouped together behind each floral scale of the male catkin. The female catkins occur in clusters of 2-5 at the tips of twigs, where they are usually more or less erect. During the blooming period, each female catkin is about ¼" long and either red or purple. Each female flower consists of a naked ovary with a pair of styles; it has neither petals nor a significant calyx. A few female flowers are grouped together behind each floral scale of the female catkin. The blooming period occurs during early to mid-spring before the vernal leaves develop. The catkins are cross-pollinated by the wind. Afterwards, the female catkins become cone-like fruits about ½-¾" long, and their scales become dark brown and woody. At the base of each scale, there is a single nutlet about 2-3 mm. long that is flattened-obovoid in shape and narrowly winged. The nutlets are distributed to some extent by either wind or water. The woody root system is spreading and shallow. Cultivation: The preference is partial sun or light shade, wet to moist conditions, and an acidic soil that is rocky, gravelly, or sandy. The root system fixes nitrogen in the soil and it reduces erosion along streambanks. Range & Habitat: The native Brookside Alder occurs in southern Illinois, where it is occasional, while elsewhere in the state it is absent (see Distribution Map). Illinois lies along the NW range limit of this species. Habitats include rocky streambanks at the bottom of sandstone ravines and canyons, swamps, fens, and edges of lakes. 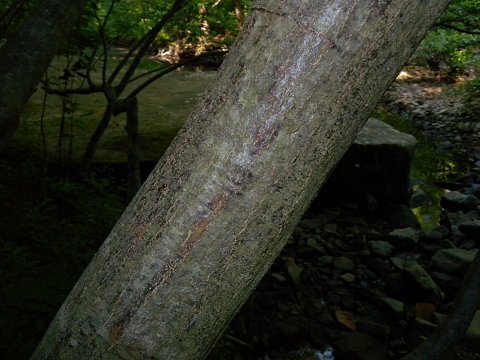 This alder has a more southern distribution than other native alders (Alnus spp.) within the state. 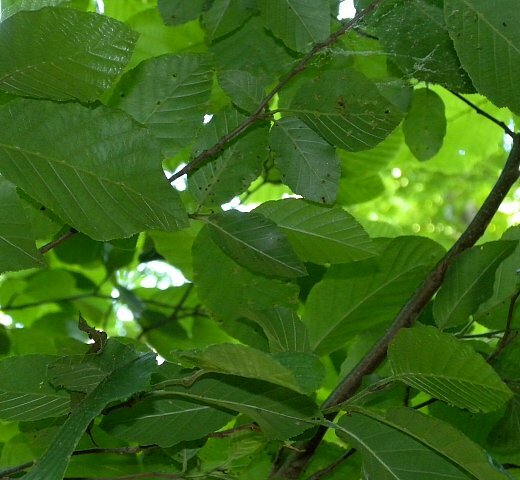 Faunal Associations: Alders (Alnus spp.) are host plants of beetles, aphids, moth caterpillars, and other insects. Examples include wood-boring larvae of the beetles Saperda obliqua (Alder Borer) and Xylotrechus quadrimaculatus (Birch & Beech Girdler), various leaf beetles (Calligrapha spp., Chrysomela spp. ), Altica ambiens (Alder Flea Beetle), Corythucha pergandei (Alder Lace Bug), Prociphilus tesselatus (Woolly Alder Aphid), Psylla floccosa (Cottony Alder Psyllid), Eriocampa ovata (Woolly Alder Sawfly), and caterpillars of such moths as Aethalura intertexta (Four-Barred Gray), Pero hubneraria (Hubner's Pero), and Venusia comptaria (Brown-Shaded Carpet). Because alders frequently attract woolly aphids and similar insects, the carnivorous caterpillars of an unusual butterfly, Fenisca tarquinius (Harvester), can be found on these shrubs. These caterpillars feed on woolly aphids. For a more complete list of these insect species, see the Insect Table. Among vertebrate animals, the seeds, buds, or catkins of alders are eaten by such birds as the Ruffed Grouse, American Woodcock, Swamp Sparrow, Eastern Goldfinch, Common Redpoll, White-Winged Crossbill, and Pine Siskin. The extinct Passenger Pigeon also fed on the catkins. Because Brookside Alder is often a densely branched shrub, it provides cover and nesting habitat for the American Woodcock, Rusty Grackle, and other birds. Mammals use alder shrubs in various ways. The Woodland Jumping Mouse (Napaeozapus insignis insignis) feeds on the seeds, while White-Tailed Deer browse on the foliage and twigs. Beavers feed on the bark and wood, and use the small trunks and branches of these shrubs in the construction of their lodges and dams. Photographic Location: Along a rocky streambank at the bottom of a sandstone canyon in southern Illinois. Comments: In addition to Brookside Alder, other common names of this shrub (Alnus serrulatus) include Common Alder, Smooth Alder, and Hazel Alder. 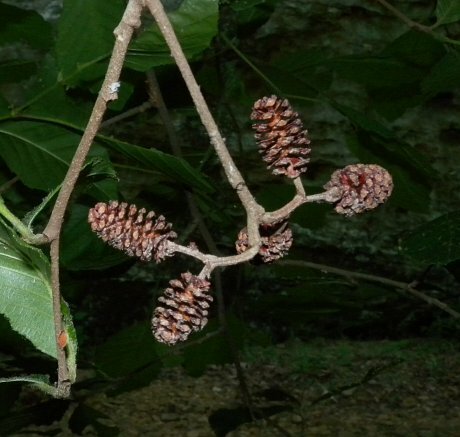 This is the only native alder that is found in southern Illinois, making it relatively easy to identify. In northern Illinois, the similar Alnus incana (Speckled Alder) can be found. This latter shrub differs from Brookside Alder by the conspicuous white lenticels on its trunks, the whitened undersides of its leaves, and doubly serrated margins of its leaves. A European species that is sometimes cultivated and escapes, Alnus glutinosus (Black Alder), is a substantially larger tree. It has leaves that are more orbicular in shape and its leaves usually have fewer pairs of lateral veins (7 or less).